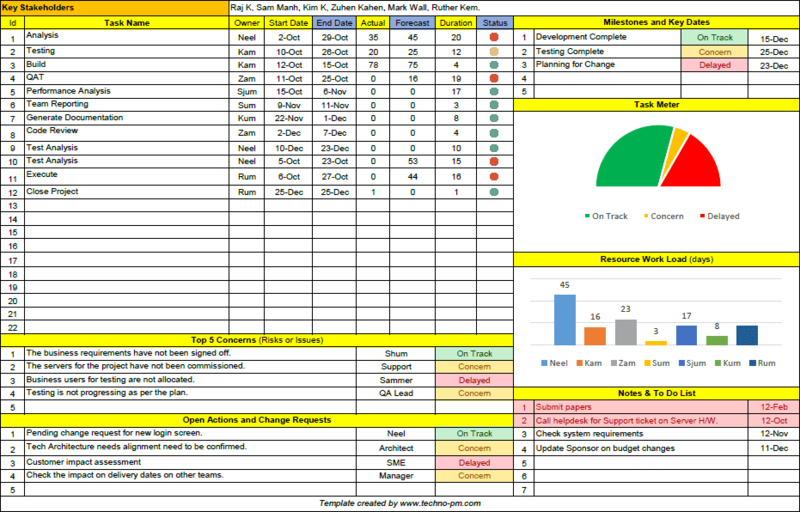 Project Dashboards aid by visualizing the critical success factors. 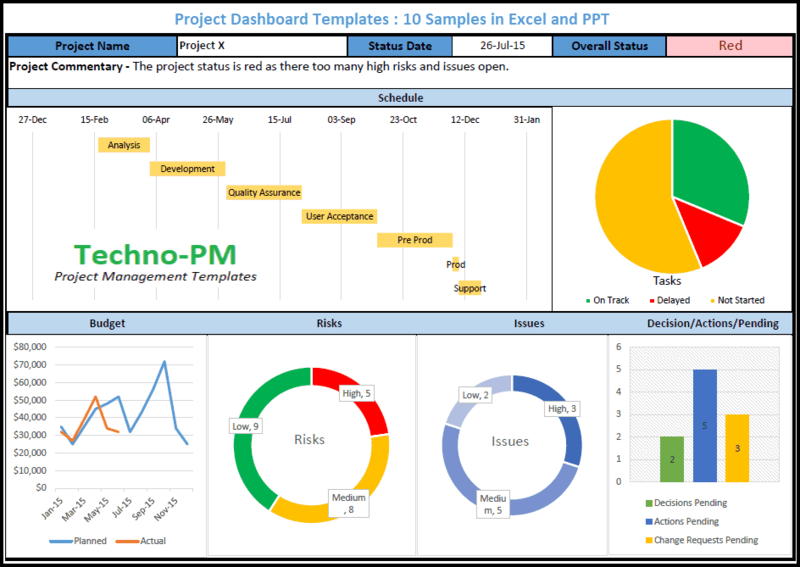 Project Dashboard Template can also be used to report status to senior level management who do not have the time to read a detailed status report. We recommend the following dashboards for single projects - Project Dashboard Template in PPT, Dashboard with Heatmap dashboard for Project Management and Agile Project Management Dashboard with Excel. We recommend the following dashboards for multiple or portfolio of projects - Portfolio Management Dashboard Excel, Multiple Project Portfolio PPT, Executive Portfolio Dashboard, and Multiple Project Tracking Template Dashboard. The excel project dashboard gives a birds-eye view of the critical parameters and their statues using graphs and timelines making the job of management easy. The senior management always wants to have a quick overview rather than a detailed analysis. Has a commentary section which can be used to enter a free-form update. This should be short and crisp and should give a clear message to the management. The project dashboard has an overall project status indicator which can be used to set overall project status on the dashboard. Displays the schedule as a timeline which makes it easy to visualize the schedule. It is easier to understand the timeline as it is like a Gantt chart. The schedule should be used to display only the high-level phases. Also displayed are the task details. The details include tasks on track, delayed and not started. 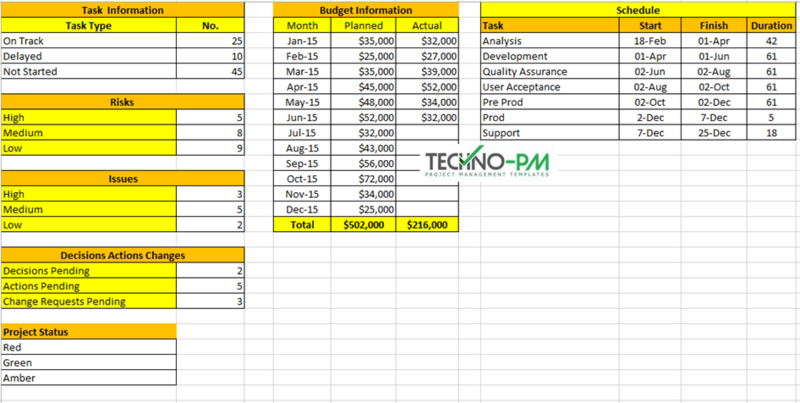 This information will help the management in understanding how many tasks are pending. The dashboard also tracks budget on month by month basis which makes it easy to access if the budget is still on track. 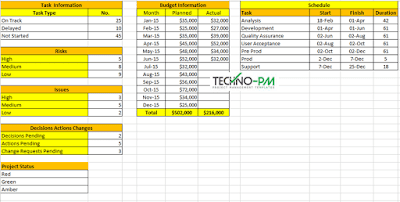 Displaying the project budget in a monthly fashion allows natural interpretation of the budget is tracking. Budget is one of the critical parameters for senior management. The dashboard also displays decisions, actions and change requests pending. This information helps the management in understanding what items are pending. Easy to configure and use as it is excel based. As it is in excel it can easily be email or shared with someone. And it is absolutely FREE. Feel free to edit the template to create your own excel template. As it is a separate document, the dashboard is not linked to the project plan and will need manual data entry. In a busy management schedule, this task can be overheard. The scheduled timeline can be complicated to change if you want to add additional tasks. The recommendation is to limit the number of tasks in the timeline. Limit to displaying only high-level timeline tasks. Deleting the tasks is easy. 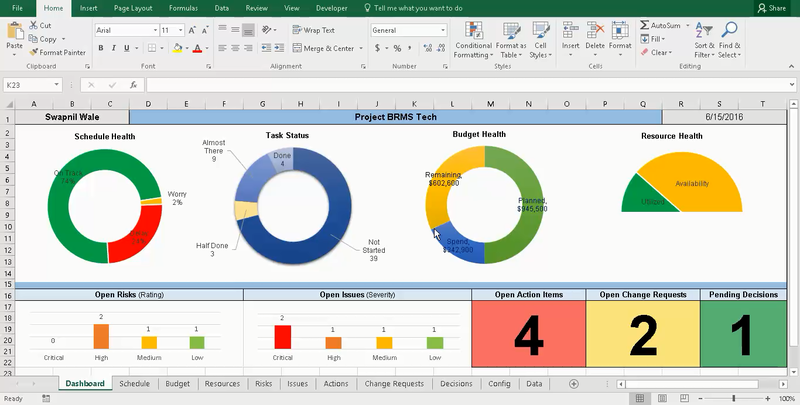 The excel spreadsheet has two tabs - dashboard and data. Dashboard sheet has the actual status with timeline and graphs. Data has all the fields to be entered so that the graphs work on the dashboard. The data sheet has a Schedule section which task name, start, end and duration. The duration is auto calculated. The schedule should be high level rather than details. The Task Information has the number of tasks On the track, Delayed and Not started. You should be able to get this information from your plan. Budget Information - Should contain the budget on monthly basis. There are two columns planned and actual. Risks and Issues contain a count for High, Medium and Low risks and issues. Decisions, Actions, and Change requests have information about pending decisions, action and change requests. Status can be used to configure the project status you want to see on the dashboard.